Tracking your expenses could help you save money at tax time. But it's essential that you keep receipts and documentation to back up each expense and justify your deductions if necessary. Follow these tips to organizing receipts and expenses to make taxes easy. Home and office expenses: receipts; electricity, gas, and water bills; home repairs, maintenance, and renovations; internet and phone bills. Vehicle expenses and mileage: gas and fuel costs; vehicle repairs and maintenance; receipts for registration and licensing; tires; rental or lease statements; personal and business miles driven. Education costs: tuition, student fees, textbooks and other required equipment. Child care expenses: pay stubs showing child care payments via a reimbursement account at work; receipts for child care while you were doing charitable work. Medical expenses: health insurance premiums for you and your family; out-of-pocket expenses. Other expenses: moving costs; charitable donations; tax planning and investment expenses; work uniforms; laundry or dry cleaning for uniforms and other work-only attire; business supplies (pens, paper). This category of expenses (moving, unreimbursed employee, tax/investment planning expenses) can be deducted as an itemized deduction subject to 2 percent of your adjusted gross income through the 2017 tax year. For tax years beginning with 2018, these 2 percent deductions are no longer allowed unless they are a business expense. 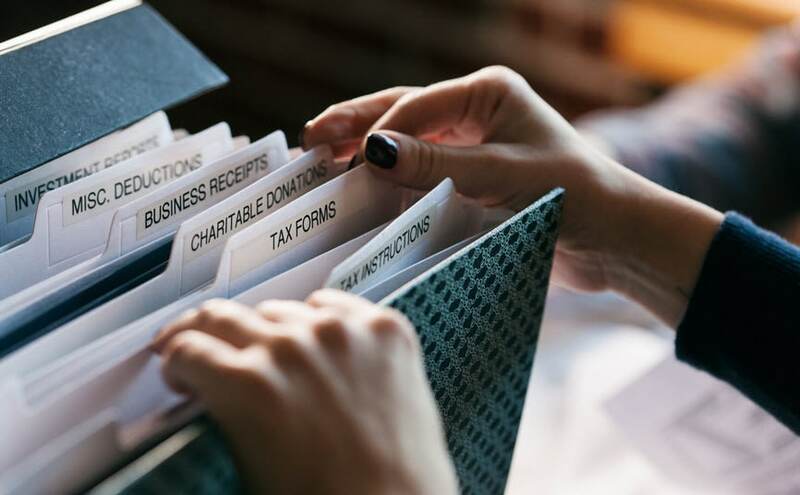 Organize any new receipts from the previous month into the correct folder (including checking for receipts “lost” in your wallet or bags) to ensure all your deductions are accounted for. This system keeps your workload manageable so you can organize and store the documentation without feeling overwhelmed at tax time. It also gives you a chance to make relevant notes on your receipts—like which client you met at that soon-to-be-deducted power lunch—while the details are still fresh in your mind. Check in on the electronic documentation you have as part of your regular check-in to make sure you have a digital backup of all your receipts before you put them into long-term storage. If an evening spent scanning receipts isn't your idea of fun, consider tracking your day-to-day expenses on the go. Take photos of your receipts to create a digital backup at the point of sale, then simply import and organize them during your monthly tax check-in. Some budgeting apps include support to organize and store photo receipts, like Mint. If you use budgeting apps or software, take advantage of this feature to track your deductible expenses as well. Even the best-planned and carefully organized storage systems can fail through no fault of your own—a lost phone, crashed laptop, broken hard drive, or even a fire or flood can wipe out physical or digital documentation. Back up your digital receipts regularly to the cloud or an external thumb drive so you're covered in case of a hardware or software failure.